Lord Greystoke has arrived at the logger's camp in the Congo, and will stop at nothing to find and eliminate his long-lost cousin, Tarzan. Robbie and Jane set out through the jungle to warn Tarzan, and find themselves trapped in the sprawling ancient city of Opar, where the insane Queen La is running an illegal Coltan mine. With a volcano threatening to explode, Tarzan, Robbie and Jane must form an unlikely alliance to save themselves. Not everyone will make it out alive . . .
Long time readers of The Book Zone will know that I really enjoyed the first two of Andy Briggs' New Adventures of Tarzan books. The Greystoke Legacy was a cracking reinvention of Edgar Rice Burrough's iconic jungle warrior, and the sequel, The Jungle Warrior, was even better. Now Faber have published the third book in the series, and in my opinion it is the best one yet. This is rip-roaring adventure writing at its very best, with the author seamlessly blending classic boys' own thrills with a modern fast-paced story. If you haven't already discovered these books then I strongly recommend that you pick up the first in the series and read them in order, as although they can be read and enjoyed as standalone books, there are many plot threads that cross between volumes. For this reason, if you want to avoid spoilers of the previous two books you may not want to read on. Andy Briggs dropped something of a bombshell at the end of The Jungle Warrior with the appearance of Lord William Greystoke, the current holder of the title that should rightly be Tarzan's. It was Greystoke's father, and thus his son too, who commissioned the hunter Rokoff to track down and kill D'Arnot and Tarzan, in order to protect their inheritance. With Greystoke now in the jungle, it can surely only be a matter of time before there is a major confrontation between the two cousins. However, at this moment in time Tarzan is oblivious to these dangers, and he is more concerned about protecting his family of gorillas, the Mangani. Tarzan and the Mangani have travelled away from the site of his parents' plane crash to a new grazing area where there is a greater abundance of food. However, this area also falls within the territory of a highly aggressive group of chimpanzees, and Tarzan has to be constantly vigilant as their attacks are violent and bloody. Meanwhile, Jane and Robbie are miles away, back at the logging camp, working out how they can sabotage Greystoke's plans. Mixed in to all this is a quest for the long lost (potentially mythical) ancient city of Opar, and the riches it supposedly contained. 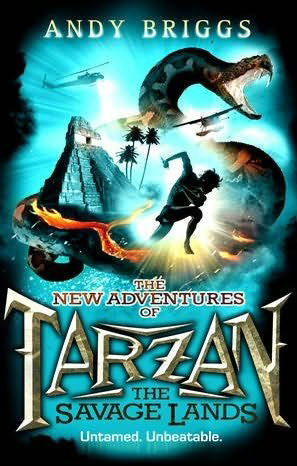 Unlike the previous two books in the series, Tarzan and Jane spend much of the story apart, although their respective journeys gradually bring them closer and closer to a set of explosive and violent climactic scenes, where, in the words of the book's blurb, "not everyone will make it out alive". Thus, the POV of the narrative switches back and forth between Tarzan and Jane/Robbie and therefore the Lord of the Jungle does not appear as much in this book. This would be disappointing if it weren't for the brilliant and superbly paced story that Briggs has crafted for his characters. The previous two books have contained a strong environmental message, although at no point has this come across as preachy. I was a little concerned before reading this book, that at some point this aspect might become a little too much, but the message in this book, whilst still there, takes a back seat to the adventure this time. As in previous books Andy Briggs has delved deep into the Tarzan stories created by Burroughs, and reintroduces more characters and locations from those originals. In this case Briggs has resurrected Queen La and the lost city of Opar, although both have been twisted to suit this modern story. The Savage Lands is yet another great addition to the series, and I hope there are more to come in the future. This book does not end with the cliffhanger introduction of a new character, but there are plenty of minor plot threads left untied to merit another volume. The Savage Lands was published earlier this year and my thanks go to the lovely people at Faber for sending me a copy. One of the first Usborne books to be published, in 1975, and Peter Usborne's all-time favourite. As used in evidence at the high court trial of Soviet spy Oleg Gordievsky, who testified that this book gave away the KGB's tradecraft. The author, Falcon Travis, remains a mystery to this day. When I was a child I wanted to be a spy. Or a detective, but mainly a spy. Whether this was fuelled by my love of the James Bond films (especially at the time those of Roger Moore which seemed to be on TV every Bank Holiday Monday in the days when we only had three TV channels) or not I do not remember. But what I do remember is the collection of spy craft books that I gradually manage to build up by saving up my pocket money. I can remember all the titles (and some of their authors), though sadly many of them are out of print these days. Titles such as The Secret Agent's Handbook by Peter Eldin, Spy School by Gyles Brandreth and Whizz Kids How To be A Spy were read over and over again, as me and my friends tried (and failed) to learn morse code and left coded messages for each other at dead letter boxes. Sadly, my copies of these books were lost many years ago, most likely as a result of me being the eldest of five as many of my things got passed down (except for my precious Three Investigators books, that it). These days I could not describe the contents of any of these books (should anyone be desperate enough to inquire), but there were two other books in my collection that have lived long in my memory, and even today I could wax lyrical about them. Coincidentally, both are published by Usborne, and even better, both of them are still in print (and I have copies of their modern editions - hurrah!). One of them, The Spy's Guidebook, I have mentioned on The Book Zone before, but the other has never had a mention until now, and that is The KnowHow Book of Spycraft. 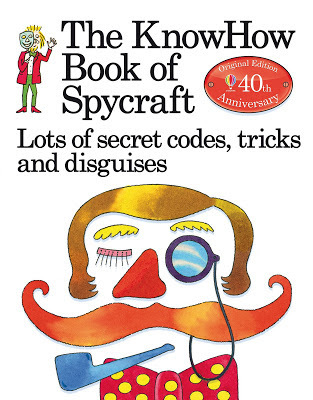 The KnowHow Book of Spycraft was one of the very first books published by Usborne, shortly after Peter Usborne set up the publishing house back in 2013. This year is the 40th anniversary of this momentous occasion and in order to help celebrate their birthday Usborne have published a shiny new edition. 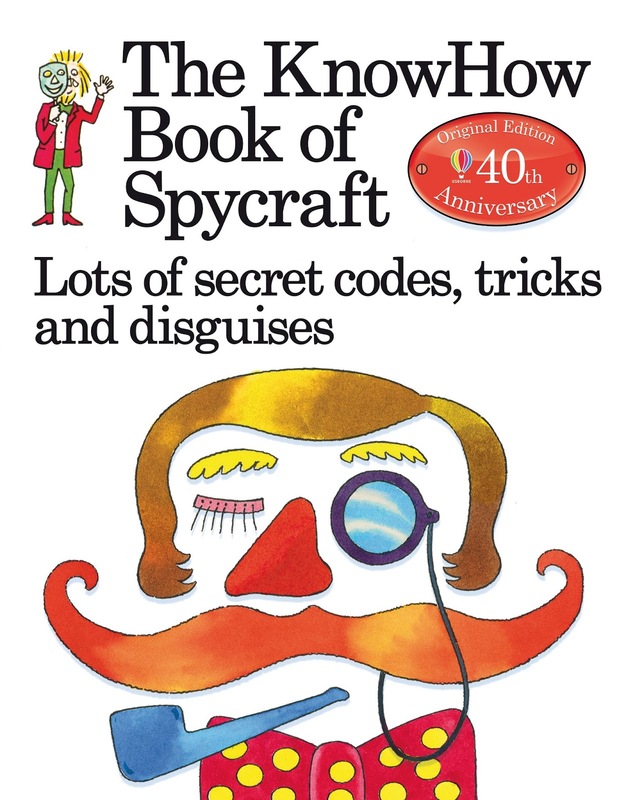 After 40 years The KnowHow Book of Spycraft is still Peter Usborne's favourite Usborne book, which is quite an achievement considering the number of amazing books that they have published over the past decades. I was incredibly grateful to receive a copy of the 40th anniversary edition from the lovely people at Usborne, and the moment it arrived and I turned to the first page I was hit by a wave of nostalgia. Although the matter-of-fact and easy to follow (and highly instructive) text does play a part in this, I think it was mainly due to Colin King's brilliant and distinctive illustrations. Colin also illustrated The Spy's Guidebook (and its companion The Detective's Handbook) and the reason I remembered these books more than the other I mentioned earlier is down to the style of the illustrations and their vivid colours. However, this book is not just a nostalgia piece for forty-year-old men. It is just as relevant and enjoyable for today's kids as it was for me back at the tail end of the 1970s. The illustrations and text are timeless, and it is perfect for boys (and girls) who struggle with reading fiction, but love fact books and anything else that feeds their imagination without them having to follow a story plot. I was already a massive reader by the time I picked up this book as a child, but some of my friends were not, and this (and its like) were possibly the first books they actively chose to read outside of the classroom. I would imagine that most of them would be just as happy as I was to get their hands on this new edition, and it never ceases to amaze me how books like this can resonate with people through decades. The new edition of The KnowHow Book of Spycraft is due to be published on 1st June, although a certain online retailer already has copies in stock. For a cover price of a mere £5.99 you could do a lot worse this weekend than buy a copy for your reluctant reader son or daughter, although don't be too surprised when they start acting furtive, go through your clothes in search of disguises and add an extra potato to your weekly shopping list so that they can make invisible ink. Estelle’s therapist has prescribed her a dose of solitude. So she’s staying in a cottage in the middle of nowhere, trying to come to terms with her traumatic past. But there’s more going on in the quiet nearby woods than she knows. An army of unnatural shadows lurks among the trees. Unlike those that harmlessly follow our footsteps, these shadows can rise up, they can touch … and they can kill. Estelle and her old friend Sandor must battle this shape-shifting army and the sinister forces that have called them into being. But how can you defeat your enemies when you’re afraid of your own shadow? 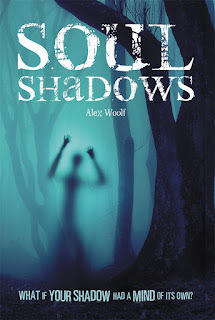 Soul Shadows by Alex Woolf is one of those book that sort of took me by surprise, in that I thought it was going to be one thing, and it turned out to be something rather different. Based on the press release I received from the lovely people at Curious Fox, I thought this was going to be a fairly traditional ghost/supernatural story, and I was expecting a steady build-up to the horror, over a period of several chapters, as we meet the main character, he/she finds themselves in a potential spooky situation (haunted house, sinister village, deserted woodland), something's lurking in the dark, etc. What I got was a fast-paced horror story where the action kicks in before the end of the first chapter and doesn't relent until the final page. 18-year-old Estelle has a history of mental health problems, stemming from an incident of severe psychological abuse carried out by her mother when she was much younger. Since then she has tried to kill herself several times, and it is only though the help of her therapist, Dr Kirby, that she has finally turned a corner. As the next step in her therapy, Kirby has recommended that she spends a week on her own in his remote country cottage. However, as Estelle quickly discovers, she is most definitely not alone and the sinister shadows she can't be sure are real are only the beginning of a nightmare battle for survival. I don't want to give too much away about the plot, but I will say that it covers themes of mental illness, identity and what makes someone human, and also the ethics of science. It is guaranteed to have the reader questioning their own opinions on these topics, as the actions of some of the characters will have you wondering who the greatest monsters are: the soul shadows of the story's title or the scientists who created them. 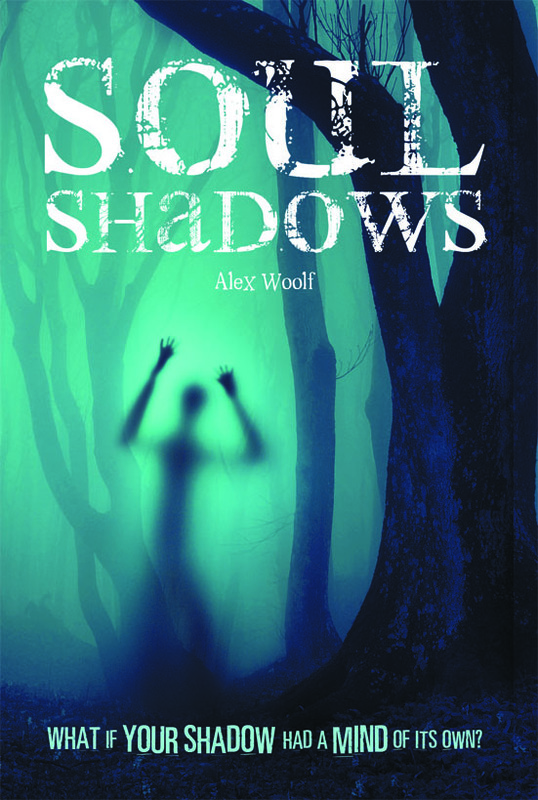 Soul Shadows differs in writing style from a large number of the YA horror books I have read. It took me a while to get used to it, as I felt that it lacked a natural flow at times, and the immediate jump into the action was also something that jarred a little with me. However, after I had read a couple of chapters I did a little research and discovered that this book was not written in the traditional manner. It first saw the light of day on Fiction Express, a website that gives young people the chance to influence a story as it is being written by a professional author. In simple terms, the author writes a chapter a week, and at the end of each chapter the Fiction Express readers are offered a series of options as to how they would like the story to continue. This innovative method of writing a book not only explained the occasional lack of flow in the plot, but also the non-stop, breath-taking pace of the story. Soul Shadows has many genuinely scary moments, but at times it is the moral issues that are more terrifying. If you prefer your horror to be more action and less slow-burning suspense then this is the book for you. How did you get the idea for Soul Shadows? It’s set in the fictional English county of Wintershire, which is a deliberately bland, undramatic, fairly flat sort of everyplace – possibly based on Bedfordshire. I wanted to give it an ordinary setting to make the events, when they start happening, seem more startling. The story begins in an isolated cottage near a spooky wood. 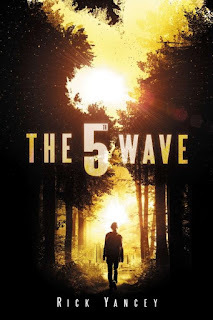 The wood becomes a major setting for the story, as does the nearby village of Delhaven, which turns out to be under the control of a sinister scientific establishment called the Facility. Who are the main characters? Are they based on anyone you know? The main characters are Estelle and Sandor. Estelle is an 18-year-old girl who suffered a psychological trauma when she was 14 (her mother locked her in an attic for 12 weeks), and has been in and out of institutions ever since. She’s been sent to the isolated cottage as a form of exposure therapy to get over her fear of being alone. Sandor is a 21-year-old soldier and childhood friend of Estelle’s. At the start of the novel he’s wrestling with his own demons following a tough tour of duty in Afghanistan in which he saw a close friend die. In the course of the novel, both Estelle and Sandor are forced to confront their deepest fears of loneliness and loss. They have to learn to relate to each other in a different way, now they’re no longer children, and a mutual attraction starts to form. Neither character is based on anyone I know. However, I once had to care for a close friend suffering from mental illness, and I’m sure that some of that experience played into my creation of Estelle. Did any books or films inspire you when writing the story? A major theme of the book is the dangers of irresponsible, uncontrolled science, and as such my book takes its place in a venerable tradition within horror and science fiction, from Frankenstein to Doctor Jeckyll and Mr Hyde, and The Island of Doctor Moreau. In creating a scientific basis for the shadows, I was influenced by the inventive pseudoscience of TV shows such as Doctor Who and Primeval, and the scary, claustrophobic scene in the Facility (a high-tech research establishment in the woods) was partly inspired by the film Alien. What writing techniques did you use in the scary scenes? First of all, I tried to imagine myself in the scene, and attempted to express, moment by moment, even second by second, how I would feel if it was happening to me. I used short sentences, and slowed the action right down, drawing out the tension. I was careful not to over-describe the monsters – just giving hints of their horribleness and leaving readers to imagine the detail for themselves. After writing my initial draft I went over it several times, ruthlessly hacking away anything extraneous, so I was left with something as lean and mean and hopefully scary as possible. Do you have a favourite line or scene from the book? Estelle opened her mouth to scream, and the girl-thing seemed to copy her, except that its mouth went on growing and growing, like a distortion in a nauseating hall of mirrors. Its shiny beetle-black eyes gazed hungrily back at her. Saliva dripped from needle-like teeth, as fresh soil from the forest floor began to show between the cracks in its cheeks. Was it always called Soul Shadows or how did you think of the title? It began life as a short story called Shadow of Death. Not long after I’d written this, I was approached by a publisher of interactive novels, Fiction Express, to write a novel for teenagers. I immediately suggested an expanded version of ‘Shadow of Death’. I explained the concept to Paul Humphreys, MD of Fiction Express, and he loved it. He particularly liked the name I’d given my monsters – soul shadows – and he said that might make a good title for the story. Describe Soul Shadows in three words. What is the most scary thing that’s happened to you? It was either the time I found myself alone about fifteen feet from a barracuda while snorkelling off the Florida Keys, or else the time I was scaling a rock face in a gorge in the South of France and suddenly realised I couldn’t find a way up or down, or the time I saw a greenish glow in the darkness of a room I’d wandered into by accident while staying in a country house in Surrey. What is your favourite scary book and movie? Great question! Let me think! Sorry, I simply can’t limit this to one of each. Favourite scary books are Stephen King’s It, The Shining, Night Shift and Carrie; Clive Barker’s Books of Blood and Weaveworld; Jay Anson’s Amityville Horror; Ray Bradbury’s Something Wicked This Way Comes; Peter Benchley’s Jaws; and the short stories of M R James. Favourite scary movies are Psycho; Night of the Living Dead; Halloween; Friday the 13th; Nightmare on Elm Street; The Exorcist; The Omen; Alien; The Ring; The Vanishing. If you could have dinner with any authors, past or present, who would you choose? I’d probably choose Stephen King, Roald Dahl, Kurt Vonnegut, Kazuo Ishiguro and J D Salinger. Something creative, like a sculptor or choreographer or a designer of avant-garde iced buns. However, I’d probably avoid a career in shadow puppetry, for obvious reasons. How do you write? (morning/evening, how many hours, in what room/location, on computer or wth pen etc? I love writing in the early mornings, fuelled by plenty of tea. I always write on computer these days, and I work from a room in my house. I generally take quite a long lunch break, then work until around six or my kids demand my attention – whichever comes sooner. If people like the book and want to get in touch or find out more about you, how do they do that? 1. The White Mountains by John Christopher. One of the best, most “realistic” take on aliens I’ve ever read. Creepy. Moving. It justfeels like a real alien occupation. Find this book and its sequels. Trust me. 2. Foundation trilogy by Isaac Asimov. The man wrote like a thousand books, so I haven’t read all of them (how did he have time towrite all of them? ), but this is hands-down my favourite Asimov. Mind-blowing, complex, so well-structured. A movie could never do it justice. 3. 2001: A Space Odyssey by Arthur C. Clarke. Another landmark work of sci-fi. In this case, the movie does do the book justice. 4. Planet of the Apes by Pierre Boulle. Forget all the movies. This novel takes the genre, smashes it to pieces and reassembles it into a savage satire and a searing social commentary. The ending is three thousand times more chilling than the original movie’s. 5. 1984 by George Orwell. Okay, I confess most people don’t consider this, the original dystopian masterpiece, a sci-fi novel. But it was set in the future (he wrote it in 1948), and it includes technology that did not exist in Orwell’s time. And, like all great science fiction, it is more about now than some distant future. And now here is the next extract of the audio book. If you have been following the blog tour you will already know that a different snippet is being released each day - more details can be read on the banner over to the side of this blog, or if that is too small I have included it at the end of this piece. I totally love Andrew Lane's Young Sherlock Holmes books, as long time readers of this blog will know from the glowing reviews I have given every volume in the series so far. I am also an avid reader of what I tend to refer to as adult quest thrillers (by the likes of Scott Mariani, Matthew Reilly, Chris Kuzneski et al). 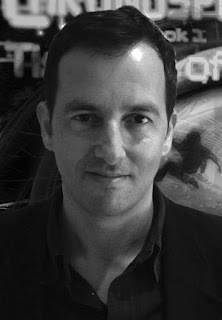 So when I found out that Andrew had written a modern-day quest-style thriller for a younger audience I couldn't help but be excited, especially as there is a link between this story and another of Sir Arthur Conan Doyle's greats. Main character Calum Challenger is the great-grandson of Professor George Challenger, a character who first appeared in Doyle's The Lost World. He lives alone in a converted warehouse in London, having lost his parents in a car crash some years earlier. So far, so heard it all before I hear you saying. However, Calum was also in that car crash and did not emerge unscathed, for he is paralysed from the waist down and therefore rarely leaves his modified home. Instead, he spends hour after hour searching the internet using a fantastic (and expensive) computer set-up, hunting for sightings, rumoured or otherwise, of cryptids. Cryptids are creatures that are either long extinct or merely rumoured to have existed, but whose existence has never been proven or acknowledge by science. Calum believes that many of these supposedly mythical creatures really exist, and may have genes that could hold the cure to cancer, and many other modern diseases. And perhaps even a way to regrow his nerves and give him back the use of his legs. Calum's mission is a solitary one, until one day a Brazilian boy called Gecko comes crashing into his life. Literally. Gecko is a very talented freerunner, but his skills have come to the attention of some Eastern European gangsters who want to utilise him to carry out robberies. Whilst racing across the London rooftops, Gecko is caught by surprise, and the next thing he knows he is sitting on a sofa in front of a very shocked Calum. Almost at the same time, fourteen-year-old hacker Tara Flynn is being blackmailed by the mysterious (and sinister) Nemor corporation into hacking Calum's website. With a little help from Gecko, Calum brings Tara into the fold, and it isn't long before the adventure really starts, with this unlikely team of outsiders heading off to Georgia with an ex-special forces chaperone, in search of a yeti-type creature that may be the missing link between neanderthals and homo sapiens. And naturally, the evil forces of Nemor are in hot pursuit. 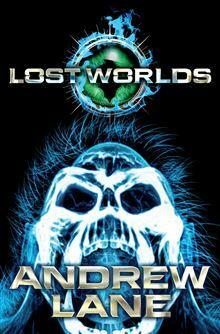 Lost Worlds is a thrilling and hugely enjoyable read that I raced though in an afternoon. This is the first in a new series from Andrew Lane, and as such a lot of time is spent setting up the characters and their situation. The adventure itself then does not start until we are pretty much two-thirds of the way through the book. Some readers, especially those who are lacking in patience, may not have the staying power to stick through this first part of the book, although I feel that Andrew Lane has done such a great job with his characters that many reluctant readers will persevere, and enjoy the technology-filled story. Once the action reaches Georgia and the action kicks in we are treated to an adventure that races along at breakneck speed. And this is where I faced one of the biggest disappointments I have experienced in a book for some time. The story simply does not finish in any way I would have expected from a writer as good as Andrew Lane. I'm not talking about a thrilling cliffhanger that sets us up for the next installment, I mean it just seems to peter out. As I was getting nearer to the end of the book I started to worry that the story would end with our heroes trapped and facing likely doom, like in a classic Republic serial - I just couldn't see how Andrew Lane could possibly bring the story to a satisfying end in the rapidly diminishing pages I had left to read. And he didn't. It's almost as if an editor told him that he had to stick to 350 pages, even though the story was 380 pages long. Even writing about it now, several days later, I'm still a little angry about this - it turned what would have been another 2013 five star book into a book that I have rather generously given four stars to on Goodreads, but on reflection may change to three stars. Be warned, I have a long memory Andrew Lane - I expect a return to form in the next outing for Calum Challenger and his merry band of misfits. Yes, you read that right. Despite my frustration at the ending (or lack thereof), I will definitely be reading any Lost Worlds sequel. There are plenty of threads left dangling that have me wanting more, and I loved the three main young characters of Calum, Gecko and Tara. You can find out more about Lost Worlds at www.panmacmillan.com/lostworlds where you can read an extract of the book, as well as enter a competition to win an iPad mini. My thanks go to the lovely people at Macmillan for sending me a copy to review.